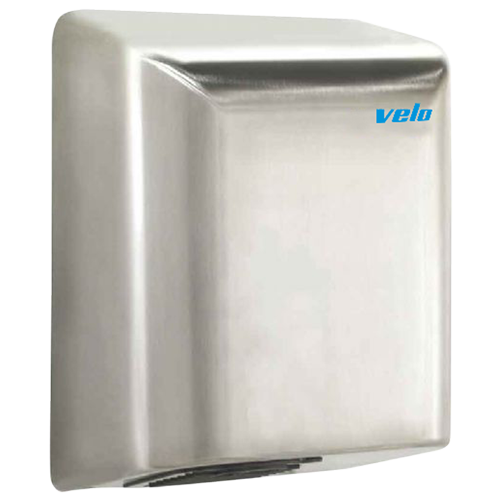 The competitively priced Velo Bigflow hand dryer combines low noise and class with one of the best warranty’s in its class. It’s sleek European design makes it suitable for a wide variety of low – medium traffic situations like cafes, doctors rooms, small offices, restaurants and theatres. Dimensions: 327 x 250 x 152 mm. Approximate drying time: 36 seconds. Casing: AISI 304 Grade Stainless Steel, 1.2 mm. thickness. Sound level at 2m. : 60 dB. Temperature at 10 cm. (room temperature approx. 21ºC): 51 ºC.